Metropolis piece made for Sate Wunderbar, Amsterdam. 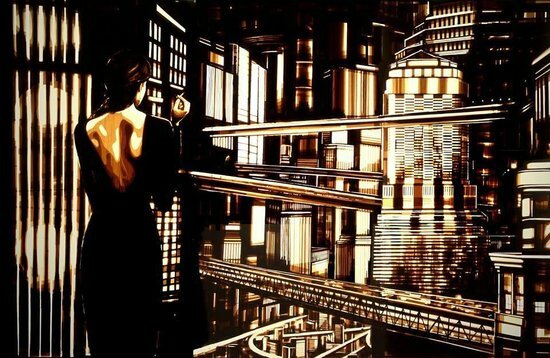 Artwork by Max Zorn, made with brown packing tape on acrylic glass. 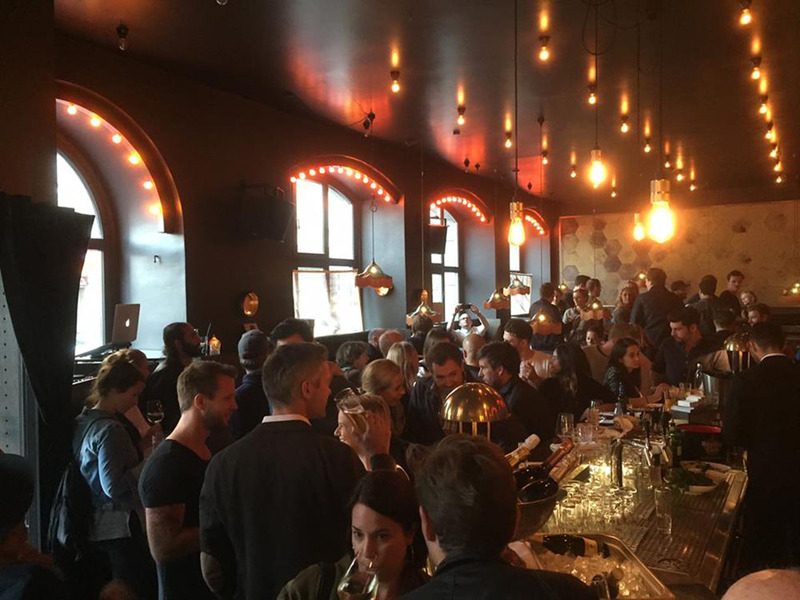 Amsterdam — Saté Wunderbar, a basement cocktail lounge in downtown Amsterdam, is also home to a unique Max Zorn piece echoing a film still from the 1927 German science-fiction film Metropolis. Something between classic beauty and a highly stylized futuristic city, the result is a fusion of Max Zorn nostalgia mixed with a modern underworld setting of abstract lines and cityscape depth. 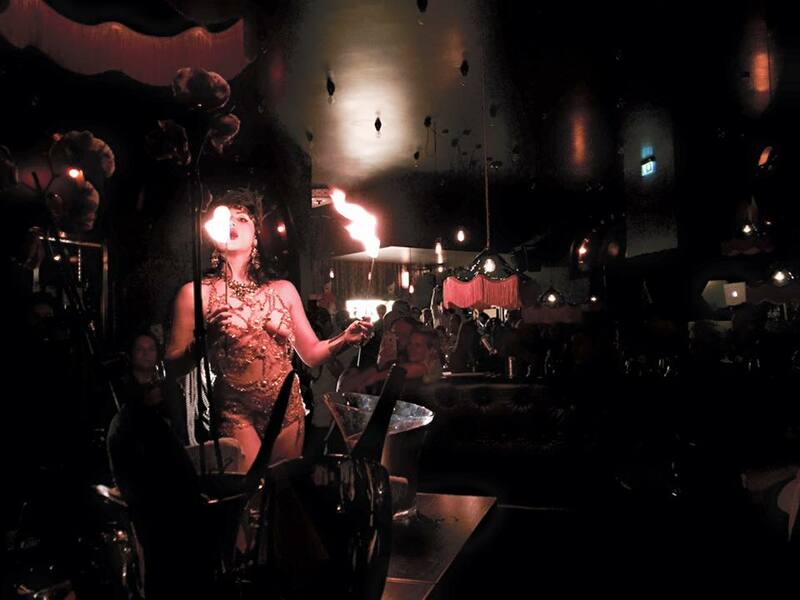 Munich — Chi Chi, an adult speakeasy cocktail bar in the heart of luxurious Munich, houses a sultry Max Zorn work from the artists burlesque dance series. The opening event, sponsored by RedBull and m.u.c.a gallery, revealed soft, feminine subjects with hints of ruby and dramatic expression. London — The Sanderson Hotel is in the heart of London’s West End and a landmarked 1950s building transformed by Morgans Hotel Group into a surreal Cocteau-like dream world, and housed a residency exhibition of Max Zorn artwork that transformed its in-house lounge and bar into a Roaring 20s hideaway. Smart and tempered with a healthy dose of wit and irony, artworks hung between the curtained walls as the mix of guests and atmosphere seemed to bring the collection of art to life. Amsterdam — Drover’s Dog is Amsterdam’s high end Australian restaurant and lounge looking for the perfect illuminating and backdrop setting to its long, sleek craft cocktail bar. Max Zorn was commissioned to create something panoramic, a nod to romantic, breezy Australian landscapes. The result: a 9ft x 3ft sepia-tone wonder of Bondi Beach, one of Australia’s most famous surf spots. 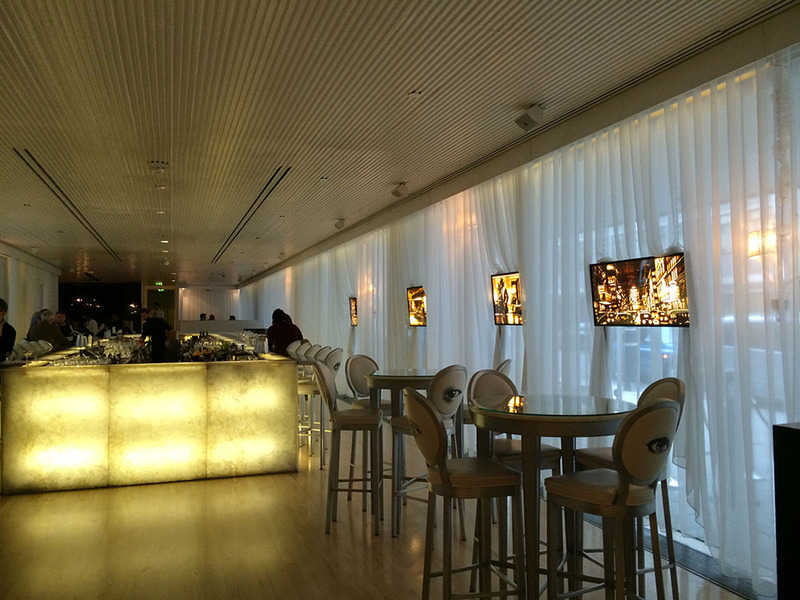 London’s Sanderson Hotel fused the concept of a illuminating cocktail bar with a Max Zorn exhibition between the curtain walls of one of the most popular lounge bars in downtown London. 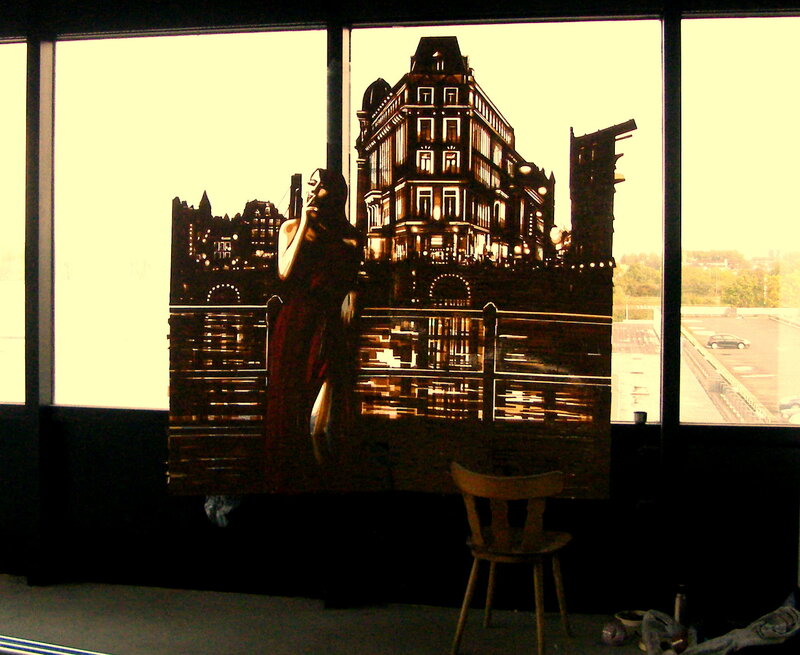 Tape art installed in the courtyard restaurant of the Amsterdam Museum of History, made of brown and ruby packing tape illuminated by the inside lighting. 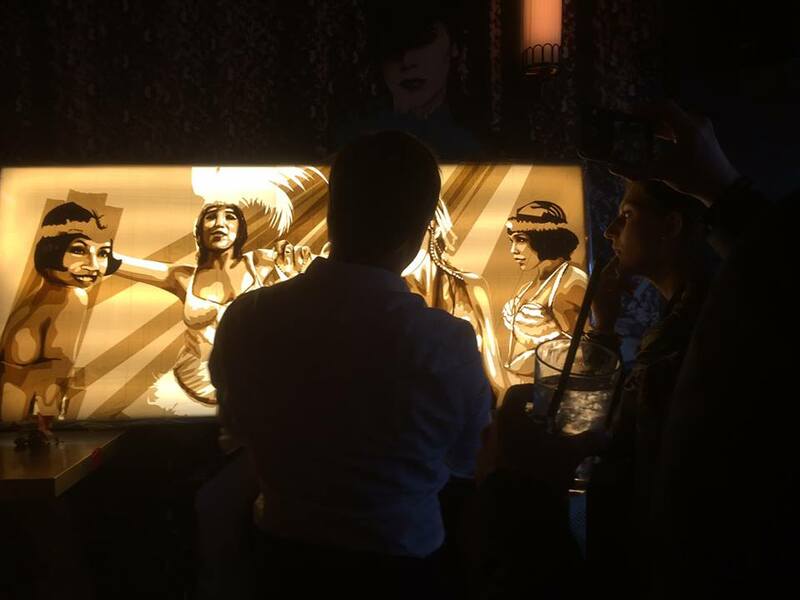 Max Zorn commissioned by Red Bull to create a burlesque tape art for this Munich cocktail lounge. Max Zorn creating live at the RedBull Chi Chi opening event night. Burlesque the Bavrain way at the RedBull Chi Chi opening event night. Guests wait to enter Max Zorn solo show at the Sanderson Hotel on opening night. 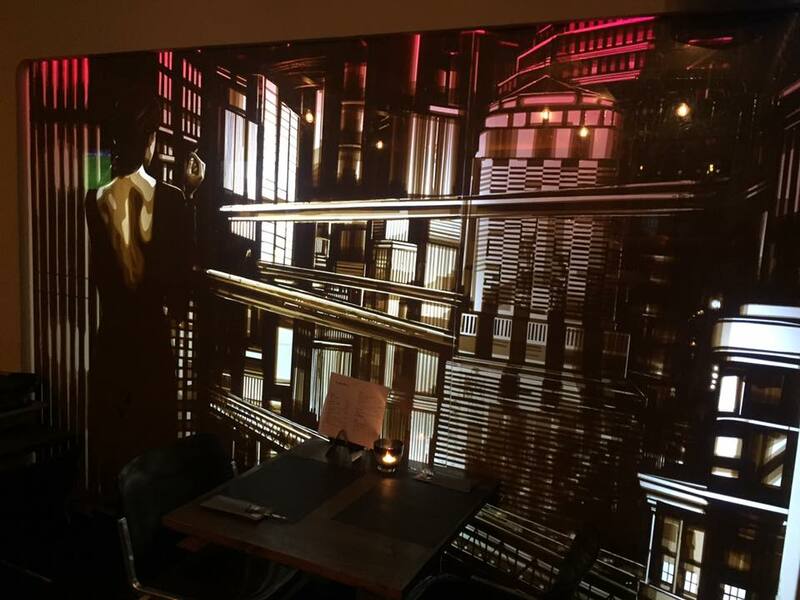 Society Wunderbar cocktail loung in downtown Amsterdam commissioned this Metropolis-esque piece, about 9ft x 9ft installed in a light wall with rotating LED lights.